What's the most important thing in life? It's fellowship with the Father. 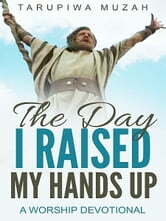 The major solution to stress is Worship; you have to raise your hands up when faced with difficult situations. You must look beyond your problems & acknowledge that you are a son or daughter of a Father, God in Heaven, who cares for you and who knows how to make you come out of that situation. In this little Worship Devotional, Tarupiwa helps you, the reader, to pray & Worship, as he shares his own personal testimonies of how he raised his hands up & worship when he was faced with hard situations. God wants to show his Glory through you, so find time to devote yourself to prayer & worship through this devotional, and see your life take a whole new meaning, be blessed.